I‘ve finished all of my painting for my new office space!! 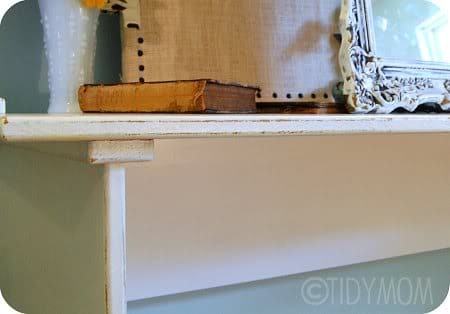 I showed you in this post my newly painted office space, and in this post I showed you my progress on painting my desks white and how they used to look. 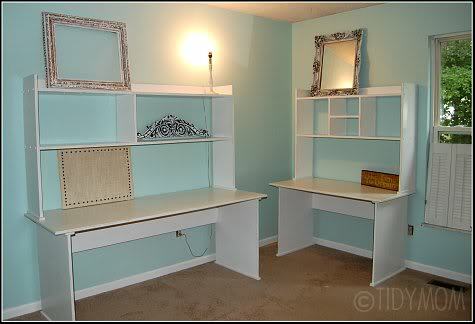 I love how the desks turned out all white. I distressed the edges just a bit to give it a little bit of a worn look. When I went to Lowes to buy the white paint for my desks, I purchased a gallon because it was cheaper than buying 2 quarts. So what does a girl do if she has extra paint? She decides to paint the trim and the closet door too!- which turned out to be a much bigger task once I got started, but it was WELL worth all the extra worth, because I think the room really needed it! I have been collecting things from the resale shops and garage sales for my new office. So I had a few goodies that I decided would look best with a little of the white paint lightly brushed over them. I think it gave these frames and scroll thing just the look they needed for this room! 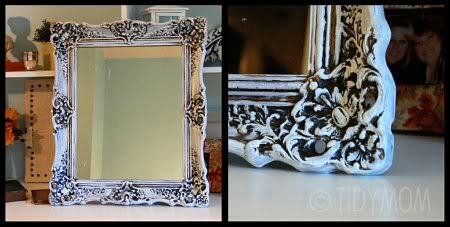 This mirror, I forgot to take a before picture of, but it was gold with black in the recessed parts ? I think it’s my favorite piece so far!? I had fun “dressing it up” with some of the goodies I have been buying for the room. It can’t stay exactly like this, because I need to move our computers and all of our office stuff to the room- but I LOVE how it looks like this!! I still have several small projects in mind that I need to work on, and I haven’t put anything up on the walls yet – but later this week I will share the whole room with you, and you can see how I’m actually using it, for now. What color did I put on the walls? It’s a spa blue/green that I mixed from two colors I tried that weren’t quite right. I love the white and black with it, but I do have a few small things to paint, and I’m on the look out for a small hutch – I’d love to bring in another color if anyone has any suggestions please leave it in the comments! Cheryl, I have a black mirror in my guest room with all those cute curls and nooks and crannies in it. I'd love to get the look you got on your mirror. 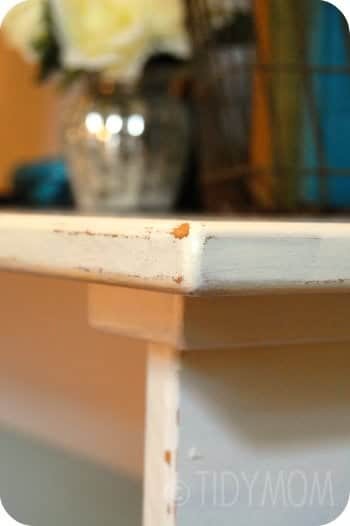 How did you apply the paint in order to avoid getting it into the recessed areas? Kathy, I just used one of those little sponge brushes with the wooden handle – dipped it in my paint, made sure it wasn't dripping in paint, then just brushed it over the frames – the grooves are pretty deep, so as long as you don't push the brush/sponge, it will just paint/cover the top surfaces – it was really very easy! Wow! You office is just stunning. 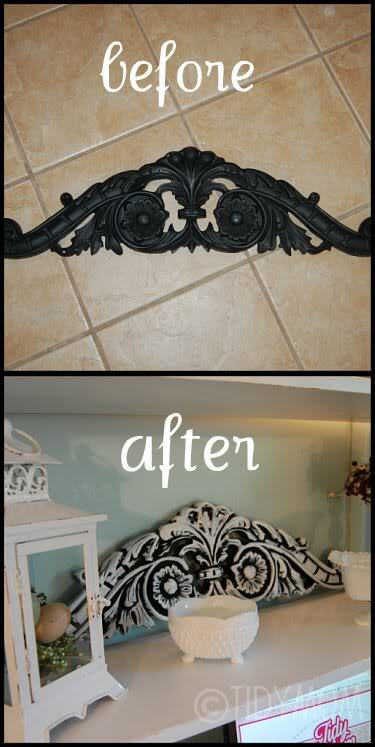 I LOVE how you accented those darker items with a light coat of white paint! genius. If I were you, I'd choose an accent color from the opposite side of the color wheel from the cool blue/green. Red, or orange, or a beautiful coral would be great! I love the black & white on the scroll. What a big difference it made! Can't wait to see the whole room. I really like your wall color, too. 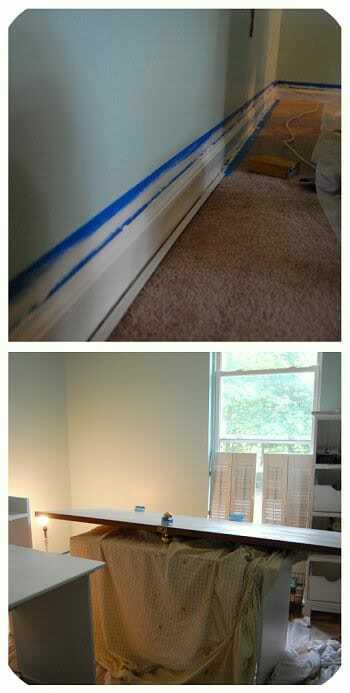 I just love that shade on the walls. Just love it. I think it would be beautiful to bring in some red or buttery yellow. Or both!! That is turning out so cute! I like it! I love your makeover! 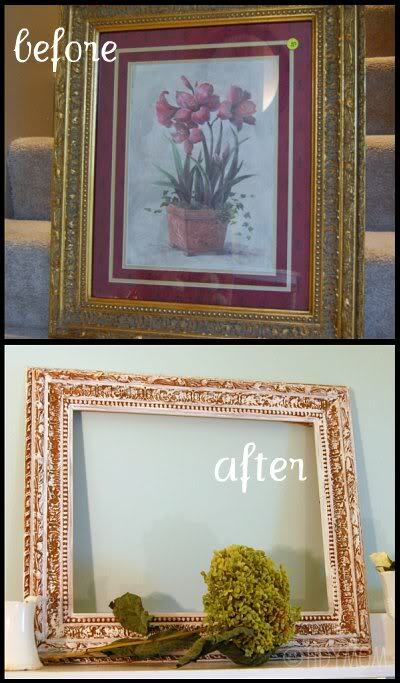 I really want to do the same thing to an old frame I have…did you paint the frame and then put another color over the top where you didn't push is into the grooves? Or did you just put one color over the gold? 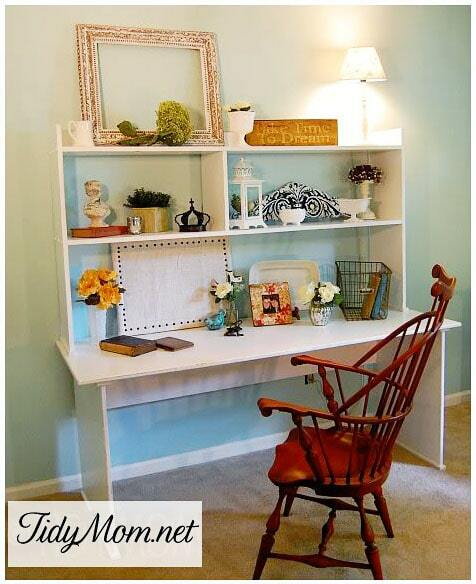 I love the white with the blue walls! So calming.